The larvae of this species feed on a variety of weedy herbs particularly ones in the Acanthaceae and Amaranthaceae as well some others are recorded such as Synedrella nodiflora, Sida acuta and Sida rhombifolia. Mature larvae 52-55 mm long, body dark brown or black with yellow lines, several reddish brown spines present; head orange brown with 2 long black spines. 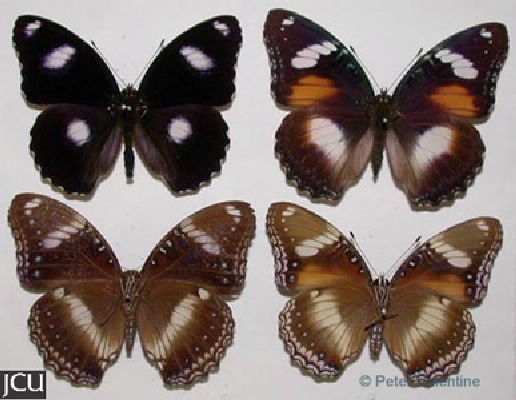 Adults black with a large white central spot bordered by iridescent purplish-blue on each wing; lower surface basically brown with spots and bands which may be white or orange-brown.